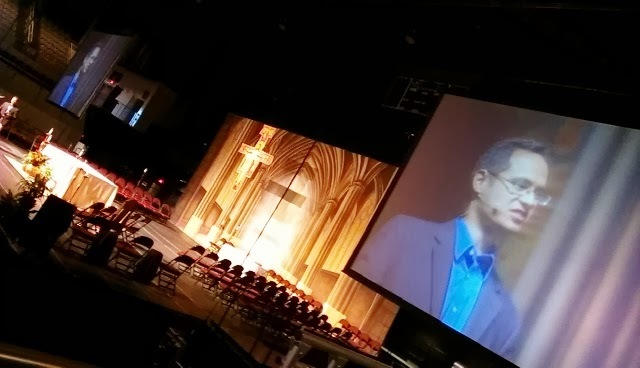 This past weekend, at a conference here in North Dakota, I had the pleasure of hearing Dr. Edward Sri share his insights on Mother Mary. And as he does so well, he brought the Gospel alive for me during his time on stage at the Bismarck Civic Center, and made me more endeared than ever to Our Blessed Mother. As I heard him talk, I couldn’t help but wish our Protestant brothers and sisters would open themselves more to the Catholic take on Mary. I know Mary is a stumbling block to many. But there is so much richness here, and I fear that in the worry we’ve gone too far with Mary, many Christians risk missing out on the treasures of walking with her. It was Jesus who first walked with her, after all, and I’m convinced we can learn even more about Jesus by walking with Mary. I have a long way to go, but I have loved Mary from an early age and look forward to new discoveries in the years to come. Sri, the father of six young children, introduced the topic by recreating the moments when his youngest daughter, Josephine, took her first steps. He recounted the glee he saw on her face at the thought of braving this new adventure, and then her hesitation as she peeked over the chair she’d been using for stability, her face and body now showing second-thoughts. Until…she saw her father. Once he was in sight, little Josephine felt courageous, and so she let go and made those first steps, falling into his arms just as she was about to topple over toward the end. She was so delighted with herself at that point that she wanted to do it again, and again and again. Sri used this visual to help us see that when God calls us out, when He asks us to step out in faith, He doesn’t expect it to happen all at once. “Mary was a great model of someone who made those steps of faith,” Sri said. But she took them one at a time, and that is the way we all can and should approach our walk in faith with the Lord. Sri mentioned several steps in Mary’s walking out in faith — steps we might use as a model for our own stepping out. I’m going to start with them now, and finish in subsequent posts. Why would this have been troubling? Because, Sri explained, the wording would have indicated to Mary that she was being called on a mission; that she was being asked to be stretched as never before. “Mary realized she was standing in the shoes of Moses,” Sri said. And how daunting would that have been to a young girl? Wouldn’t we have been scared out of our wits as well? I know I would have. We are still only at step one, but hopefully you can see in this brief example how much we can learn from Mary by watching her responses. Because we, too, are being called out. There’s no doubt about it. As children of the light, sons and daughters of God, we will be asked to go on a mission. We’re at the chair, now, clinging mightily, wondering, should we let go? Should we go? Or would it be safer just to stay right where we are? Like Josephine, and like Mary, there’s likely to be that moment of hesitation, and yet in the end we are able to glimpse, in the near distance, the arms of our father. With that in our sights, we can tell ourselves, “I got this!” And off we go. But just as Josephine didn’t become an expert walker in one day, we’ll need to practice, to go slowly, to not get ahead of ourselves. And God will be with us every step of the way, offering us a safe place to land when we fall.